Over 1600 workers at Alcoa in WA are continuing an indefinite strike after five weeks. 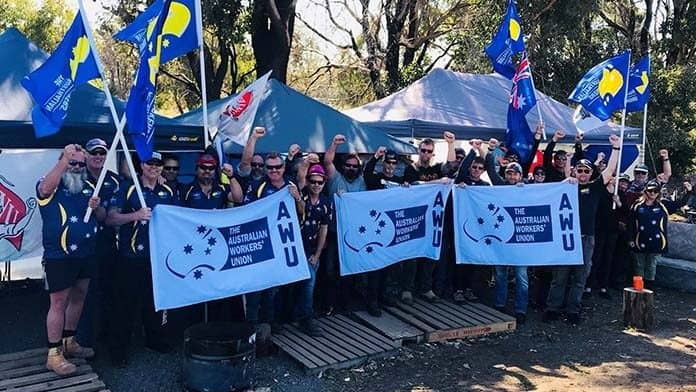 The strike, which began on 8 August, comes as Alcoa’s request to terminate the existing enterprise agreement altogether is set to be heard by the Fair Work Commission on 17 September. Alcoa employs 1600 workers in its alumina refineries and bauxite mines across the state, in Kwinana, Pinjarra, Wagerup, Huntley and Willowdale as well as at Bunbury Port. Despite offering some concessions, Alcoa refuses to budge on the core issue which strikers are concerned about, job security. It wants to remove conditions in the existing agreement that guarantee no forced redundancies except in the event of mine closures. And in return it is offering just a one-off $3000 bonus and then pay rises of 1 per cent a year. “Many of us are long-term employees who have never caused them any grief but they won’t provide assurances about not casualising employment, outsourcing contractors or agreements on manning hours,” Andy Hacking, a refinery worker and Australian Workers Union (AWU) West Australian Branch president said. Like other bosses at Port Kembla Coal Terminal, Murdoch University and the Oaky North coal mine, Alcoa is trying to use the threat of terminating the existing EBA, forcing workers back onto far lower Award conditions, to get them to accept a sub-standard deal. But a ballot on Alcoa’s latest offer ended on 6 September with an overwhelming 80 per cent of members rejecting the EBA proposal. Now a new proposal from Alcoa is awaited. Despite denying claims that they seek to casualise the workforce and eradicate security, that is the clear objective of the proposed EBA, which Alcoa told Workplace Express would allow it to, “manage our operations efficiently and productively, and [give] us the ability to respond to changing market and operating conditions”. Alcoa has admitted that the strike has reduced alumina production by around 15,000 tonnes in August, but claims to have contingency plans in place. But the workers have pledged to keep striking for as long as it takes to get a decent agreement. They deserve everyone’s solidarity.